CBCS Certification #: 17-356DDAB-007. We want you to be 100% Satisfied withyour order and we go to great lengths to make sure everyone involvedis happy. Manufactured with cover inside out. NM, Near Mint=Like New. You really have to look close to find any flaws at all. G, Good=Well worn, but still sound. Generally the lowest grade that most collectors will accept for most books. Could be soiled, lack color gloss or have tape on it. "False Moves" Suicide Run Part 6. While Frank Castle is in jail in a small town, Jimmy masquerades as the Punisher for the Mob. Marvel Comics.1994. FEEST COMICS USA. THE PUNISHER 2 IN GERMAN 1991. If you're unhappy with your order for any reason, we have you covered! WRITTEN BY MIKE BARON WITH ART BY WHILCE PORTACIO. Cover art by Al Milgrom. The Squeeze, script by Mike Baron,pencils by Hugh Haynes, inks by Jimmy Palmiotti; Punisher tries to defeat Kingpin's rivals before Kingpin kills Microchip. Item: Punisher, The (2nd Series) #1. Appearances: Punisher, The General. Publisher: Marvel. I want your comics to arrive in the advertised condition just as much as you do. TPBs count as the number of comics they reprint. Marvel Presents The Punisher. This is Vol. ll No. 24 October 1989. Printed in the U.S.A. The cover still has a high gloss. The staples are bright and tight. The panels have good color against a off white background. Appearances: Punisher. Publisher: Marvel. I want your comics to arrive in the advertised condition just as much as you do. On lots that include more than one comic, the condition listed is for a majority of the comics included. 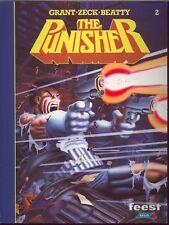 Item: Punisher (1st Series) #3. Appearances: Punisher, The Trust. Publisher: Marvel. I want your comics to arrive in the advertised condition just as much as you do. TPBs count as the number of comics they reprint. The Punisher #3 of 5. Limited Series. March 1986. Marvel Comics. This is normal in our experience. NOTE: We don't grade any raw books higher than 9.2, as once you go higher than that grading gets really subjective. How do you grade?. A RUN will be a collection of consecutive issues with no breaks in between them. A STAT is essentially a photocopy glued on to one or more of the panels by the artist done during production of the piece and is not original artwork. We will do our best to clearly identify what’s a STAT or what isn't on your page, if indeed it contains one. This includes CGC Qualified books. Most will also have a photo of the creator doing the signings at that exact event(The picture may or may not show the exact book. It is a courtesy to sign a book at a convention but the writer or artist cannot be expected to wait for a picture while each book is being autographed). Counted 12 tiny spine ticks that break color. A very faint non color breaking long crease down center of cover. Light color rub to spine back cover. Still presents well with strong colors and gloss. This includes CGC Qualified books. Most will also have a photo of the creator doing the signings at that exact event (The picture may or may not show the exact book. It is a courtesy to sign a book at a convention but the writer or artist cannot be expected to wait for a picture while each book is being autographed). This includes both CGC Signature Series and Qualified books. Most will also have a photo of the creator doing the signings at that exact event. Each COA will also include my custom seal upon it. If it does not have my seal then it is not my Certificate. NM, Near Mint=Like New. You really have to look close to find any flaws at all. We have been serving collectors since 1982. We have an outstanding record for integrity and service. Grading is strict and accurate. Story by Mike Baron. Art by Whilce Portacio and Scott Williams. However, Wilson Fisk is not one to go down without a fight. As Castle trains his recruits, the Kingpin sends the deadly killer Mr. Kliegg to end the Punisher's threat to his criminal empire. THE PUNISHER WAR JOURNAL (1988) - # 21-40 SET/LOT ( Thunderbolts ) !!! BIG BEN'S COMIX OASIS BUYS COMICS & COLLECTIBLES ! (NOTE: PICTURE OF ITEM IS AN ACTUAL SCAN). THESE COMICS ARE IN VERY FINE OR BETTER CONDITION. Multiple art pages can easily be combined because they are light and thin. For instance, two statues require a much bigger box. I have been collecting for over 30 years. A STAT is essentially a photocopy glued on to one or more of the panels by the artist done during production of the piece and is not original artwork. "Smoke And Fire" Blackwell and Jessup make their plans to destroy the Punisher, Suicide Run part 0 (prequel). Marvel Comics.1993. Punisher #13. Series: Punisher (1987 2nd Series). Sacrifice Play, script by Mike Baron, pencils by Whilce Portacio, inks by Scott Williams; Punisher and prison guard couple try to prevent Lydia Spotto and the Samson Family from rescuing their cult leader during a prison transport. THE PUNISHER WAR JOURNAL (1992) - # 41-50 SET/LOT (CHUCK DIXON) !!! I have been collecting for over 30 years. Multiple art pages can easily be combined because they are light and thin. For instance, two statues require a much bigger box. How do you grade?. A STAT is essentially a photocopy glued on to one or more of the panels by the artist done during production of the piece and is not original artwork. Punisher (1987) #52 VF 8.0 Marvel Comics,Frank Castle; $4 Flat-Rate Shipping! Up for sale is The Punisher #52 and it's in very fine condition. I have graded this to the best of my ability using over 25 years of experience. However, I am not a professional grader and grading is subjective. Punisher (1987) #64 VF 8.0 Marvel Comics,Frank Castle; $4 Flat-Rate Shipping! Up for sale is The Punisher #64 and it's in very fine condition. I have graded this to the best of my ability using over 25 years of experience. However, I am not a professional grader and grading is subjective. Punisher (1987) #65 VF 8.0 Marvel Comics,Frank Castle; $4 Flat-Rate Shipping! Up for sale is The Punisher #65 and it's in very fine condition. I have graded this to the best of my ability using over 25 years of experience. However, I am not a professional grader and grading is subjective. Punisher (1987) #66 VF 8.0 Marvel Comics,Frank Castle; $4 Flat-Rate Shipping! Up for sale is The Punisher #66 and it's in very fine condition. I have graded this to the best of my ability using over 25 years of experience. However, I am not a professional grader and grading is subjective.